Gansu ▶ (Simplified Chinese: 甘肃; Traditional Chinese: 甘肅; pinyin: Gānsù; Wade-Giles: Kan-su, Kansu, or Kan-suh) is a province of the People's Republic of China located in the northwest region of the country. It lies between Qinghai, Inner Mongolia, and the Huangtu Plateaus, and borders Mongolia to the north and Xinjiang to the west. The Huanghe River passes through the southern part of the province. It has a population of approximately 25 million (1997) and has a large concentration of Hui Chinese as well as a variety of other ethnic groups. The capital of the province is Lanzhou, located in the southeast part of Gansu. Gansu is abbreviated Gan or Long (陇/隴), and is also known as Long West or Long Right, in reference to the Long Mountain that lies to the east of Gansu. Gansu has a unique role in China. Sitting on the terminus of the Silk Road, Gansu benefited from the trade with Constantinople and India. Tibet, bordering with Gansu, has one of the most important Tibetan Buddhist monasteries in Gansu. That presence, along with the historical presence of Buddhist monks in the caves of the region, has positioned Gansu as one of the foremost regions in China for Buddhism. Gansu enjoys an abundance of mineral wealth, as well as potential for hydroelectric power, that promises to bring wealth to a region suffering from poverty. Gansu originally began as an acronym that was first used during the Song Dynasty in reference to two Sui and Tang Dynasty prefectures (州): Gan (which is located around modern day Zhangyi) and Su (located around modern day Jiuquan). In prehistoric times however, Gansu was host to a number of Neolithic cultures. The Dadiwan culture, from where numerous archaeologically significant artifacts have been excavated, flourished in the eastern end of Gansu from about 6000 B.C.E. to about 3000 B.C.E. The Majiayao culture (馬家窯文化) and part of the Qijia culture (齊家文化) also took root in Gansu from 3100 B.C.E. to 2700 B.C.E. and 2400 B.C.E. to 1900 B.C.E. respectively. During imperial times, Gansu was an important strategic outpost and communications link for the Chinese empire, as the Hexi corridor (which connects China to Central Asia) runs along the "neck" of the province. The Han dynasty extended the Great Wall across this corridor, and also built the strategic Yumenguan (Jade Gate Pass, near Dunhuang) and Yangguan (阳关) fort towns alongside the wall. As a result, prominent remains of both the wall and the towns can be found there to this date. 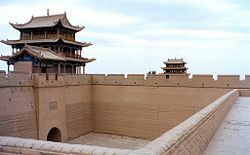 The Ming dynasty also contributed to this type of construction, by building the Jiayuguan outpost in Gansu. To the west of Yumenguan and the Qilian mountains, near the northwestern end of the province, the Yuezhi, Wusun, and other nomadic tribes dwelt and occasionally figured into regional imperial Chinese geopolitical struggles. Situated along the Silk Road, Gansu historically has served a dual role both as an economically important province and a cultural transmission vector to the rest of Asia. 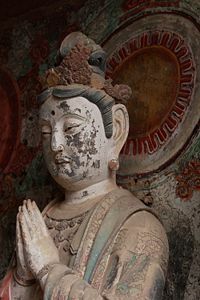 Temples and Buddhist grottoes,  such as those at Mogao Caves ('Caves of the Thousand Buddhas') and Maijishan Caves, contain artistically and historically revealing murals. An early form of paper inscribed with Chinese characters and dating to about 8 B.C.E. has also been discovered at the site of a Western Han garrison near the Yumen pass in August 2006 which pushes back the date assumed to be the origin of papermaking in China by more than one hundred years. Many parts of the province saw heavy fighting during the Muslim Rebellion of 1862-77. Its frequent earthquakes, droughts and famines have tended to slow its economic progress. Recently however, it has harnessed its abundant mineral resources and has begun developing into a vital industrial center. An earthquake in Gansu at 8.6 on the Richter scale killed around 180,000 people in 1920, and another with a magnitude of 7.6 killed 70,000 in 1932. 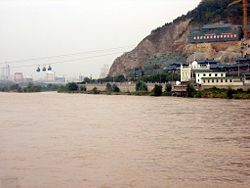 The Yellow River crossing Lanzhou. Gansu province has an area of 454,000 km², and the majority of its land is more than one km above sea level. It lies between the Tibetan Plateau, Inner Mongolia, and the Loess Plateau, and borders Mongolia to the north-west, with part of the Gobi Desert being located in Gansu. 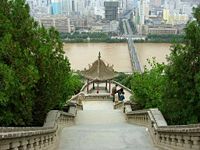 The Yellow River (Huang He) gets most of its water from Gansu province, and it flows straight through the capital city of Lanzhou. Much like the rest of northwest China, the landscape in Gansu is very mountainous, especially in the south. The mountains in the south are part of the Qilian mountain range, which contain the province's highest elevation point, the Qilian Shan Mountain, which is about 5,547 meters high. It is located at latitude 39°N and longitude 99°E. Gansu has large land resources, but the percentage of usable land is low, and as a result the proportion of cultivated land is small. Since precipitation is often scarce and irregular, Gansu is also a province that suffers from large periods of drought. 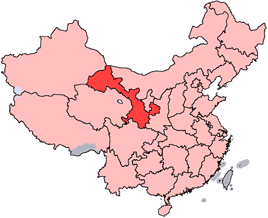 The twelve prefecture-level divisions of Gansu are subdivided into 86 county-level divisions, including 17 districts, 4 county-level cities, 58 counties, and 7 autonomous counties. These county-level divisions are then further divided into 1348 township-level divisions, resulting in 457 towns, 740 townships, 30 ethnic township, and 121 subdistricts. The Yellow River seen from the park of the White Pagoda. Agricultural production represents a small portion of Gansu's economy, and includes cotton, linseed oil, maize, melons, millet, and wheat. Gansu is also well known as a source for wild medicinal herbs which are used in traditional Chinese medicine. The province is second place in China for most medicinal plants and herbs, including some odd ones like hairy asiabell root, fritillary bulb, and Chinese caterpillar fungus. The largest portion of Gansu's economy is based on mining and the extraction of minerals, especially rare earth elements. The province has significant deposits of antimony, chromium, coal, cobalt, copper, fluorite, gypsum, iridium, iron, lead, limestone, mercury, mirabilite, nickel, crude oil, platinum, troilite, tungsten, and zinc among others. Industries other than mining include electricity generation, petrochemicals, oil exploration machinery, and building materials. Along with its mineral resources, Gansu also serves as a significant producer of energy for the People's Republic of China. Among Gansu’s most important sources of energy are its water resources, including the Yellow River and other inland river drainage basins. Gansu places ninth among all of China’s provinces in annual hydropower potential and water discharge, producing a total of 17.24 gigawatts of hydropower a year. Twenty-nine hydropower stations have been constructed throughout the province, and each of them are capable of generating 30 gigawatts. In addition to hydropower, Gansu has an estimated coal reserve of 8.92 billion tons and a petroleum reserve of roughly 700 million tons. The oil fields at Yumen and Changqing are particularly considered significant among these petroleum reserves. Besides these more traditional forms of energy, there is also significant potential for wind and solar power development in Gansu, that remains largely untapped. According to some sources, the province is also a center of China's nuclear industry, although these reports are unconfirmed. Despite its abundant natural and mineral resources, Gansu is considered to be one of the poorest provinces in China. Its nominal GDP for 2004 was about 155.9 billion yuan (19.34 billion USD) and per capita of 5010 RMB (605 USD). This poor economic status can be attributed to a variety of factors including a weak economic and technological foundation, a low degree of resource exploitation, poor industrial foundation, inadequate communication and transportation, less developed agricultural production, government revenue and investment issues, lack of arable land, mountainous terrain, and its distance from the more prosperous coastal regions of China. According to statistics taken in 2000, there were 18 institutions of higher education in Gansu, with 81,700 students and 7,208 teachers. There were also 3,661 secondary schools and regular secondary schools with 2,764,300 students and 159,492 teachers as well as 21,557 primary schools with 3,164,600 students and 125,712 teachers. The school-age child enrollment rate was 98.83 percent. 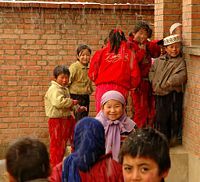 Although education has developed rapidly in Gansu, the overall education level remains low, and the nine-year compulsory education requirement that was implemented to raise standards has not become popular in the province. In order to improve the academic system in the province, a stronger effort must be made in increasing the amount of investment in education and improving educational facilities. In addition, illiteracy-alleviation measures still need to be carried out in order to bring Gansu closer to the level of some of the other provinces in China. The traditional handicrafts in Gansu are archaized carpets (using patterns from ancient carpets), luminous cups and various duplicates of sculptures and murals of the Mogao Grottoes in Dunhuang. The cuisine of Gansu is based on the staple crops grown there: wheat, barley, millet, beans, and sweet potatoes. Within China, Gansu is known for its pulled noodles, and Muslim restaurants which feature authentic Gansu cuisine are common in most major Chinese cities. Most of the inhabitants of Gansu speak dialects of Northern Mandarin Chinese. On the border areas of Gansu some people speak Amdo Tibetan, Mongolian, and Kazakh, but most of the minorities also speak Chinese, except for the Mongolian speaking Tu minority who are said to seldom speak a second language. Gansu province is home to 26,033,400 people, and most of the population, roughly 73 percent, are still rural. Gansu is 92 percent Han but also has Hui, Tibetan, Dongxiang, Tu, Manchu, Uyghur, Yugur, Bonan, Mongolian, Salar, and Kazakh minorities. Gansu is home to several different tourist sites and locations, owing to its role as a point of transmission between Chinese culture and the various cultures of Central Asia. Lanzhou, a well-known ancient city in China, is the capital of Gansu and one of its most famous tourist sites. It is the second largest city in northwest China, and also serves as the political, economic and cultural center of the province. The Mogao Grottoes near Dunhuang represent an astonishing collection of Buddhist art and religion. Originally there were roughly a thousand grottoes, but now only 492 cave temples remain. Each temple has a large statue of a Buddha or a bodhisattva, as well as paintings of various religious scenes. In 336 C.E., a monk named Le Zun (Lo-tsun) came near Echoing Sand Mountain, when he had a vision of golden rays of light shining down on him like a thousand Buddhas. After that vision, Le Zun began carving the first grotto, in order to commemorate the incident. During the Five Dynasties period the builders of the grottoes ran out of room on the cliff and could not build anymore. The historic Silk Road begins in Chang'an and leads all the way to Constantinople. On the way merchants would often journey to Dunhuang in Gansu. In Dunhuang, they would obtain fresh camels, food and guards for the journey around the dangerous Taklamakan Desert, and before departing Dunhuang they would often pray at the Mogao Grottoes for a safe journey. If they managed to come back alive they would then return to the grottoes and thank the Gods. Bingling Temple, or Bingling Grottoes, is a Buddhist cave complex in a canyon along the Yellow River. It began construction in 420 C.E. during the Western Jin Dynasty, and the site contains dozens of caves and caverns filled with outstanding examples of carvings, sculpture, and frescoes. The great Maitreya Buddha is more than 27 meters tall and is similar in style to the great Buddhas that once lined the cliffs of Bamiyan, Afghanistan. Access to the site can only be achieved by boat from Yongjing in the summer or fall. Labrang Tashikyil Monastery is located in Xiahe County, Gannan Tibetan Autonomous Prefecture, located in the southern part of Gansu, which has traditionally been part of the Tibetan province of Amdo. It is one of the six major monasteries of the Gelukpa tradition of Tibetan Buddhism in Tibet, and the most important one in Amdo. Built in 1710, it is headed by the Jamyang-zhaypa. It has six dratsang (colleges), and houses over sixty thousand religious texts and other works of literature as well as other cultural artifacts. ↑ China Through a Lens.Retrieved December 13, 2007. ↑ XinhuaNews Retrieved December 13, 2007. ↑ People's Daily Online in English .Retrieved December 13, 2007. ↑ .Retrieved December 14, 2007. ↑ People's Daily Online in English January 03, 2002 "Over 500 Ancient Grottoes Discovered in Gansu. "Retrieved December 14, 2007. ↑ AsiaArts "Artistic treasures of Maiji Mountain caves" by Alok Shrotriya and Zhou Xue-ying. Retrieved December 13, 2007. ↑ Xinhua News New Evidence suggests longer paper making history in China.Retrieved December 13, 2007. ↑ People's Daily Online.."China's Geographical Center Marked.," September 14, 2000.Retrieved December 14, 2007.